Archibald Brown, the British official at the port of Naples, looked at the roster in his hand and called out the name—“Corporal Wojtek”, but nobody came forward. It was mid-February 1944, and Brown was at Naples to help process a unit of Polish soldiers that had just arrived by ship from Alexandria, Egypt, to join forces with the Allies in their fight against the Germans and the Italians. One of his duties was to check crew manifests and speak with freshly arrived soldiers. Brown consulted the document in his hand once again. Sure, there was a soldier named Wojtek. He could see the soldier’s service number and his pay book, but the man himself was nowhere to be found, until an amused colonel came forward and led Brown to a cage. Inside was a full-grown Syrian brown bear. This, the colonel explained, was Corporal Wojtek. 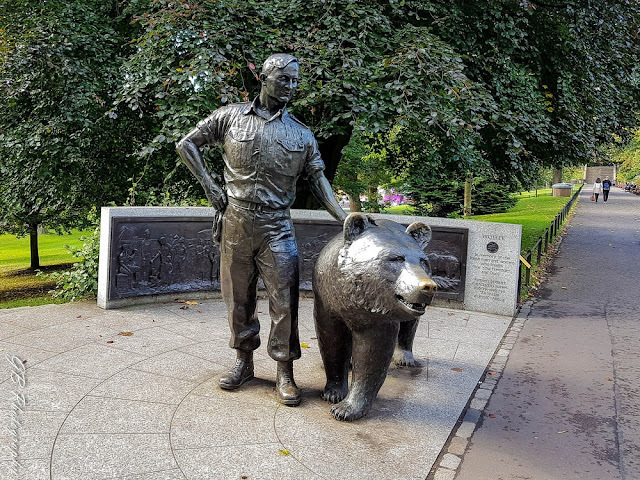 A monument to Wojtek in Princes Street Gardens, Edinburgh. Wojtek's unusual military career began in the spring of 1942 at a Polish Army camp in northern Persia, or Iran as it is known today. There, a group of Polish soldiers came across a young shepherd boy who had found an orphaned barely alive bear cub. In exchange for a few tins of food, some chocolate, a Swiss knife and other trinkets the boy parted with his cub, and the soldiers named their adopted pet Wojtek. It was a common Polish name, but given the bear’s future military career, the choice turned out to be somewhat prescient. Wojtek means “happy warrior”. The soldiers treated Wojtek like a baby, initially feeding him condensed milk out of a vodka bottle, and later nourishing him with fruits, marmalade, honey and syrup out of the soldier’s ration. Wojtek grew fast and before long took to drinking beer, which became his favorite drink. 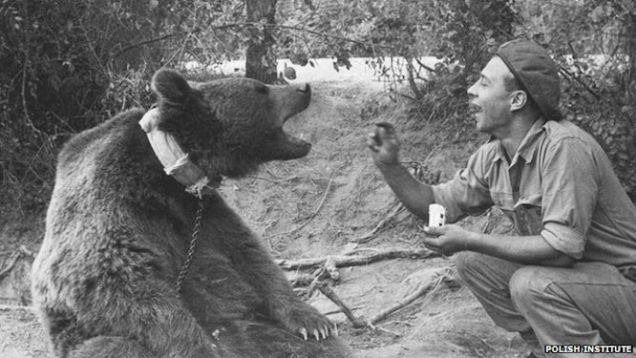 Wojtek also ate cigarettes—ate, not smoke—although some accounts say he did both. Many of the men in the camp were former prisoners of war who were released from their captivity in the Soviet Union, where they had been imprisoned after their capture during the Nazi-Soviet invasion of Poland in 1939. Following Germany’s attack on the Soviet Union in 1941, many of the captives who had survived the Gulags were released and sent to camps in Persia and the Middle East where they were retrained for the war effort. After suffering so much in the Soviet internment camps, the men were eager to return home. Instead, they were sent back to war. Their country itself was occupied. Many had lost their homes, their friends and family members. To them, the cuddly bear pup was their only source of joy. Soldiers wrestled with him, play boxing and take him on rides on the back of pickup trucks. 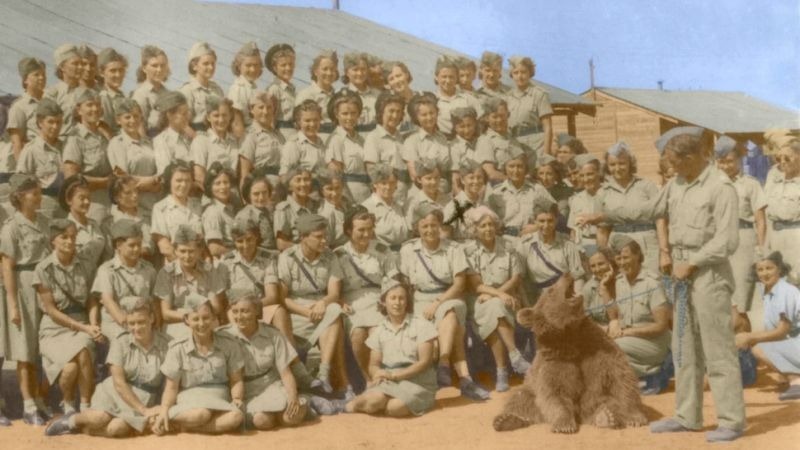 Wherever the regiment went, Wojtek went along—from Persia to Iraq and then through Syria, Palestine and Egypt. 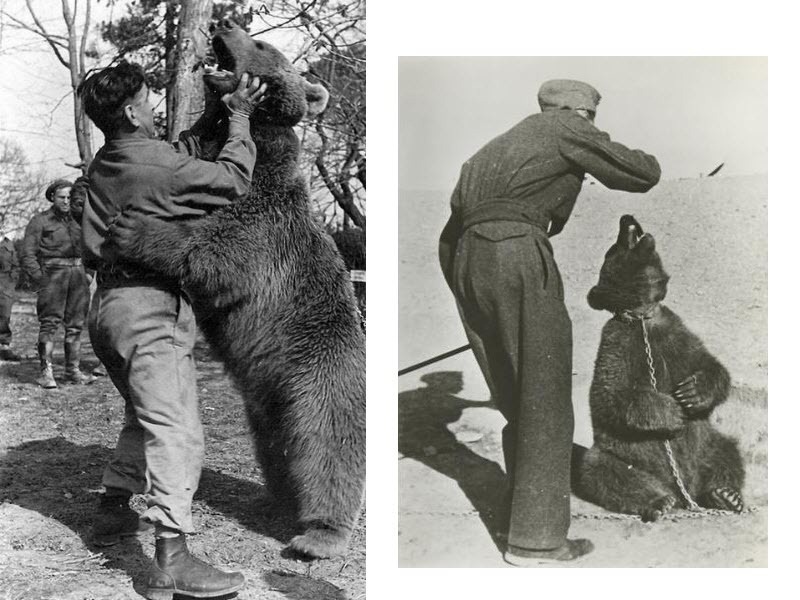 By then, Wojtek was no longer a cub. He stood 6 feet tall and weighed close to 500 pounds, which meant it had become increasingly difficult for the men to pass him off as a pet, especially when explaining to port officials. In April 1944, Wojtek got stuck at the port of Alexandria. Officials refused him on board the ship, stating that he was a wild animal and only soldiers could make the journey. So the soldiers improvised. 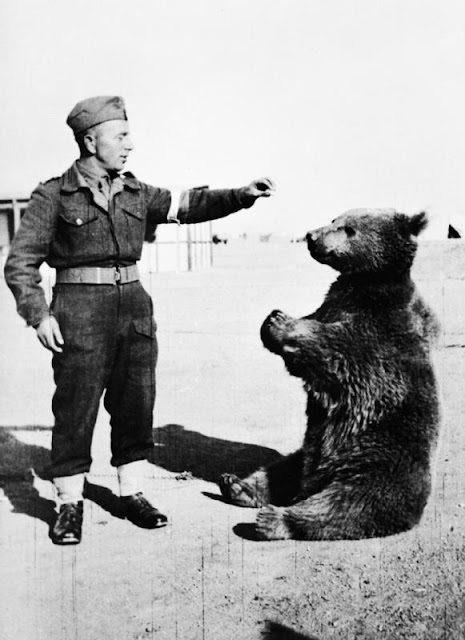 They enlisted Wojtek as a regular soldier. They gave him a rank, a service number, and even a pay book. The trick worked and Wotjek was allowed on board. Now officially a soldier, Wojtek was trained by his teammates to carry crates full of heavy mortar rounds. But Private Wojtek turned out to be a lazy thing, always looking for empty boxes to carry. His shining moment, however, came during the Battle of Monte Cassino in 1944, when Wojtek responded to the call of duty and helped his unit by effortlessly carrying 100-pound boxes of mortar shells and other supplies to the front lines. 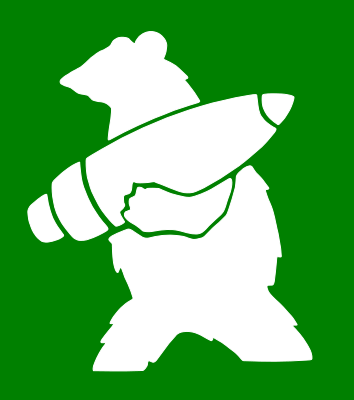 In recognition of his courage and his willingness to participate in the action, the official badge of the 22nd Transport Company was changed to one showing a bear carrying a massive artillery shell. After the war ended, the soldiers were reluctant to return to Poland, which is now ruled by the Soviets. Their memories of the gulags were still too strong. Besides, there was uncertainty of the status of new Poland—officially they were former Soviet prisoners released only due to Stalin’s amnesty. Thousands of soldiers instead sought refugee in the United Kingdom. 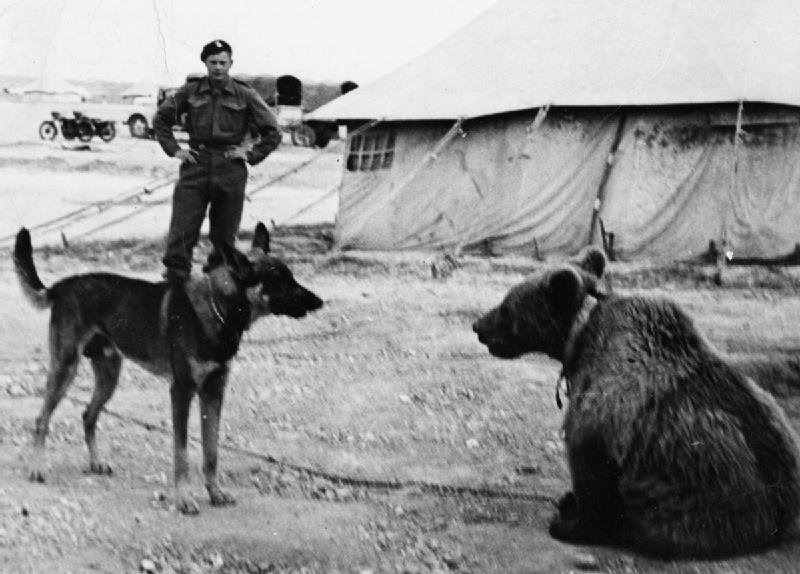 Wojtek along with some 3,000 soldiers got sent to a camp in Hutton in Berwickshire, Scotland. Wojtek soon became a local attraction there. He attended village dances and children's parties and concerts. He rode the children on his back, and while he swam in the river eager villagers watched him from the bridge above. 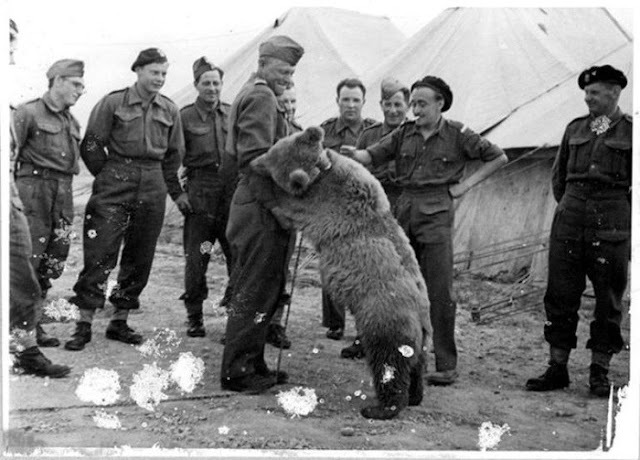 Eventually, the 22nd unit was demobilized, and Wojtek found home in the Edinburgh Zoo, where he spent the rest of his life. His former comrades continued to visit him but his isolated life in captivity made him depressed and much less friendly than before. His death in 1963 cast a cloud of grief across the nation and was met with sadness from those who knew him. Wojtek’s care taker Piotr Pendysz feeding Wojtek cigarettes.